Game code provided by Koch Media. As the player you are recruited as a pilot by the mercenary carrier Manticore. The crew are investigating an intergalactic conspiracy. You are thrust into this investigation to try and understand what caused an event known as “The Shattering” This event has caused pain and suffering within the sector. The story is voice acted which is a massive thumbs up in my book as it gets you as the player more involved in what’s going on rather than having to read text boxes. For those that are hard of hearing the text boxes are there for you to read also which is a nice addition. The fate of the galaxy is in the balance and the player is thrust into trying to save it by facing pirates, other rivals and cut throat mining companies. I quite enjoyed the story and liked all the characters being voice acted throughout of which there is around 2 hours’ worth. The AI in the ship has a personality all of her own and likes to make sure you don’t take too many risks. That just made me want to take more risk, must be a reverse psychology thing. If I were to have one disappointment here is I wish there had been a little more back story to each of the characters. They are not quite fleshed out enough and it would have been great to have built more memorable characters throughout this universe. I have already spoken about the voice acting which is quite impressive throughout. I liked the way the characters sounded adding a lot more life to the characters themselves. Each of the bosses are voice acted and each sound menacing in their own sort of way to the point where I just wanted to blast their ships and take them down. The audio within the dog fights sound good with lazer beams firing off, and rockets from your ship being launched. I could have done with the explosions sounding more explosive. I wanted that satisfaction of the grand explosive noises but I was left a little wanting. The sound of the guns though is great and sounds like you have some heavy artillery firing out of the ship. I also did like the backing music as it felt dramatic and kept the flow moving. Let’s start off by saying I was impressed that this game ran so smoothly at 60FPS while still looking rather good in the graphical department. The ship themselves all look respectable enough on a big TV but I loved also playing this one on the move. 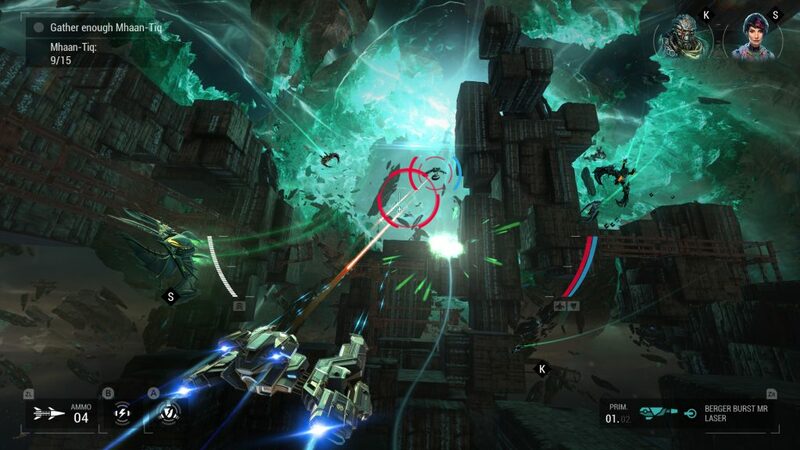 Something about flying a ship through space in handheld was just rather appealing and just gorgeous in handheld mode. Maybe it’s because we have been sorely lacking when it comes to Sci Fi shooter games based in space especially flight based ones. A lot of the game, although exclusive, has been recycled from it’s mobile brethren which is to be expected but a great job has been done with this I have to say I was quietly impressed. The backgrounds look really nice and detailed and it was fun exploring some space stations or navigating around them whilst in the midst of a dogfight. Ever since I was a kid I was fascinated with space flight or just flight on Earth. Something about the adrenalin of it all and I am sure this was all due to me watching Top Gun and Star Wars at an early age. What could be better than taking to the skies with games such as Wing Commander or Star Fox. There are others but these are the ones which stick in my memory. Truth be told I believe Space flight based Sci Fi games are difficult to get right and there have been many poor games within this genre. I am happy to say that Manticore does a lot right and offers something for everyone. First and foremost controlling the ship is a simple affair using the left analogue to move the craft left and right or up and down and diagonally. The right stick is used for boosting your ship and slowing it down while also performing aileron rolls if you move it left or right. You can invert the controls if you wish also. Trigger ZR is used to fire your main weapon either a laser beam or shot gun type plasma weapon and of course for your secondary’s such as missiles is the opposite trigger ZL. R can be used to switch between equipped primary weapons. I was pleased with the controls and felt that they were tight on the Switch and I appreciate playing these games and having physical buttons. The use of HD rumble is a good addition to get you more immersed into the action and I certainly enjoyed it a lot in handheld. There are a number of missions which take you over 35 locations and to complete the main story your looking at over 8 hours of gameplay. Each mission starts with you having to complete a certain task such as protecting a convoy from pirates, protecting the Manticore from drones or just getting into a dog fight and taking out a bunch of pirate foes. Dog fights are rather fun with targets being displayed by little red dots on the HUD. You then have to manoeuvre your ship to each target and once in view your targeting system will turn red when they are in range and this is where you let loose firing your weapons until the foe is no more. I found these battles to be quite fun but rather easy although you can change the difficulty if you prefer a stiffer challenge. My issue was that most of the AI would do the same thing in that they would fly towards you and you would pull off a dodge then fly towards you again and I never felt like I was in any critical danger or that feeling where your on the edge of your seat. Every time I had been shot so that my shields were down I would just speed away, recharge and come back. I wanted to experience homing missiles chasing me, or bullets damaging my craft so that it was crippled requiring me to dock for repairs. I wanted to feel the danger of being in these dog fights and the adrenaline rush associated with it but sadly I never really got that feeling. As I say flight feels fine and it feels quite quick when in flight but I wanted more! At the end of each mission you will have to take out the bosses which can give you that nail biting feeling at times but it’s rare. I think I enjoyed these fights the most in the game as they could last quite a long time. For some they may last a little too long and can drag out as the bosses often had good shields which you have to batter down so upgrades to your weapons certainly do become important. Once the mission is complete there is a nice warm down. Think of it like going to the gym and having a 30 minute treadmill run and then having a light jog to warm down those aching muscles. Here after your mission is complete you get to fly around the area with a little drone which will alert you to any nearby loot. The drone disappears when enemies appear so it doesn’t get trashed and you can take the foes down whilst continuing your quest for loot. Most of it ranges from plans for upgrades or ship parts which you can then use to upgrade your ship with in between missions. The upgrade system is simple enough and there is nothing complicated about it. Upgrade your guns, missiles and other parts of your ship bit by bit to make it stronger for the later missions. You can also unlock more ships as you progress through the game. The menu is nicely laid out where you can check your Lore Categories which include Species, Pirates enemy ships and many more. 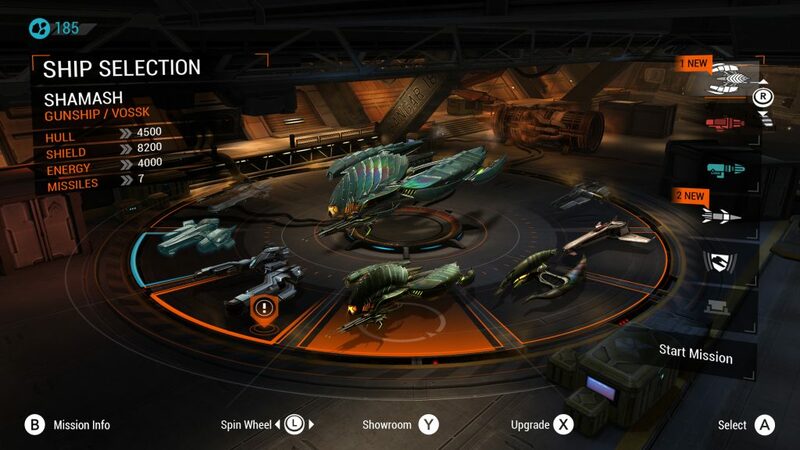 You can go to your hanger to upgrade your ship and it’s weapons but you will require fragments in order to do so. 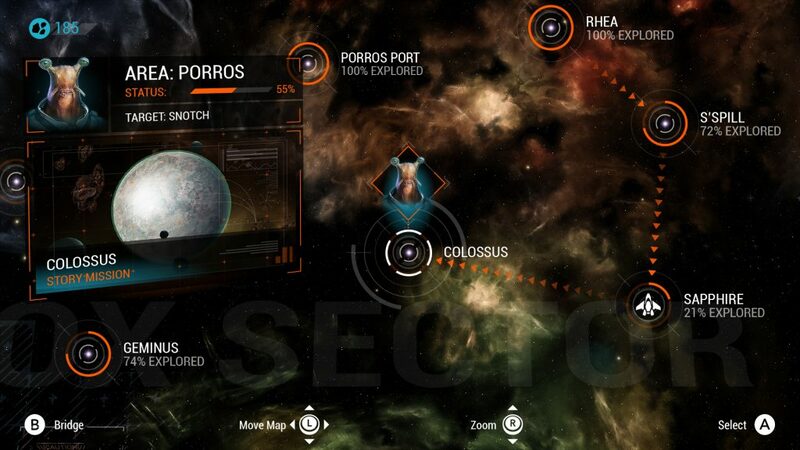 You can also check your progress and the galaxy map where you can just choose to explore for bits you may have missed. One of the main criticisms of this series on mobile platforms are all of the micro transactions within the game which is always going to cause a friction between players who feel paying a one off amount for a game should suffice and those who don’t mind paying to get ahead. Personally I am glad they are not in the Switch game at all and would appreciate it if it stays that way for all games on the Switch. So far so good you would think, the game is quite long and it’s all solid enough but this didn’t stop me from thinking this could have been more. There was something missing as it didn’t really grab me by the scruff of the neck and make me think wow. The game just felt a little bit bland at times and lacking character, which for me, was a real shame as I had greater expectations. That’s not to say I didn’t enjoy myself because I certainly did and there were moments which I enjoyed a lot but I just wished I felt a greater attachment to the game. The game costs $20 or £17.99 and if you are happy with over 8 hours of story mission then this will be for you. In terms of replay value I was done once I had completed the story mode and while you can explore other areas for loot there wasn’t anything that really drew me back in. There is no free roam or a survival mode which would have been more compelling. This is solely a 1 player game and that’s fine if that’s all you want which many will. As a one player campaign you will get your money’s worth but many will move on once it’s done. It’s a shame there wasn’t more added like an online mode to battle against friends but maybe I am asking for too much! 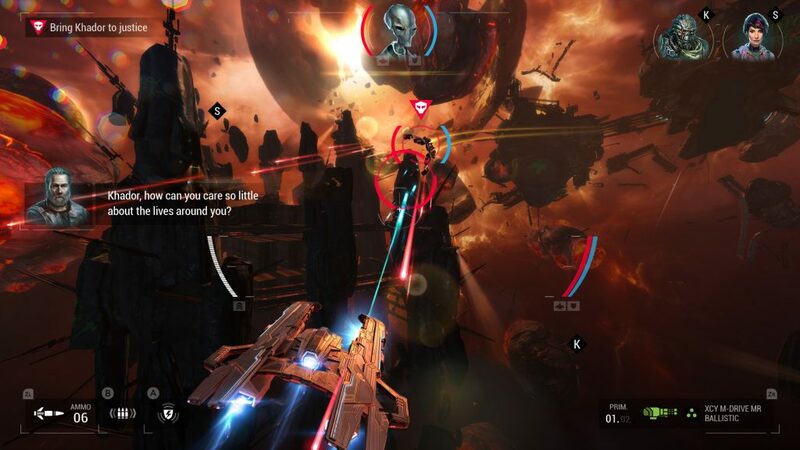 Summary Manticore Galaxy on Fire is a rather solid entry into the Sci Fi space shooter genre on the Switch. Everything is solid enough and there is something for everyone, dog fights, boss battles and some calm exploration parts. For me it was missing that extra magic to make it truly essential. The sound is good, the visuals are nice and the story is ok but rather uninspiring with characters needing more development. 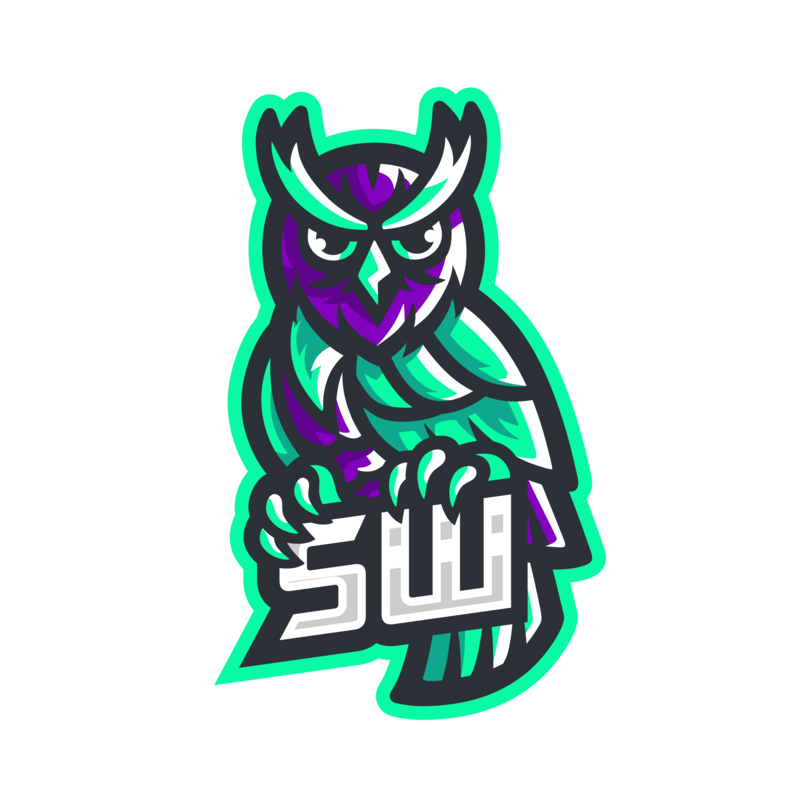 Put it all together and you get just that, a solid game which is probably just about worth your hard earned cash if you’re into these types of games and one that if you are I am sure you will enjoy. Overcooked! 2 Nintendo Switch Review – Get Ready to Spice up your Game!